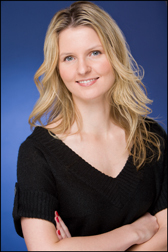 Elizabeth Phillips is the talented up-and-coming New York designer and owner of Elspeth New York whose well-crafted handbags with red-hot gorgeous designs, are destined to become your favorites. Handbags, like shoes, are something that we women can never have enough of; I know that my own closets are filled with handbags that I match to my moods as well as my outfits. Always on the fashion lookout, I recently discovered a wonderful new talent, Elizabeth Phillips, whose company Elspeth New York is producing high quality, beautifully crafted handbags that have been flying off the shelves of upscale boutiques. Meeting with Elizabeth in New York in late January 2009, I was not only impressed with her handbags and adorable coin purses, but also with her impeccable background. This is a woman who knows what she wants; she is an intrepid designer who moved to New York two days after graduating from Ohio State to follow her fashion dream. After interning in college at the prestigious Calvin Klein house in ready-to-wear fashion, Coach, the respected leather company quickly hired her post-graduation, sensing that this young graduate had what it takes to succeed. She proved them correct and was a quick study, learning the tricks of the trade, the technology of design, and fell in love with working with leather. After further honing her craft at Michael Kors, Ralph Lauren, as well as a return engagement with Calvin Klein, in late 2004, Elizabeth Phillips decided to create her own brand. She began showing her handbags at arts and crafts shows to great success, moved on to larger venues and trade shows, and soon boutiques were clamoring to sell her handbags; her star was clearly rising, and today she remains a dedicated and extremely talented player in the design arena. What I love about the Elspeth New York line is that much thought has gone into each of the designs, which can be described as classic yet also have a trendy, modern look, and have a rich sensuality to them. Elizabeth describes each design as having a life of its own and a personality. 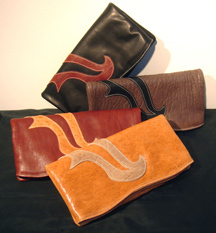 Her designs incorporate the use of high quality calfskin, suede, lambskin, and more exotic ostrich and python, and each skin is hand selected by Elizabeth. Each handbag has its own story of inspiration, including the Lake Satchel, from the Classic Collection line, named after the lake in New York's Central Park, which features Wine suede appliqués representing the movement, flow, and waves of the water, on a Black background of soft Italian calfskin, antique brass hardware, contrast stitching, is fully lined, and features great interior pockets. The Kennebunkport Large Flap, also from the Classic Collection is another handbag with a story and is a little play on one of Elizabeth's many childhood nicknames, "Lizard" which if you look closely and have a bit of an imagination, there is a Camel appliqué in the corner of the bag with two antique brass hardware "eyes", and the contrast stitching around the Chocolate soft Italian calfskin body could be its "tail." 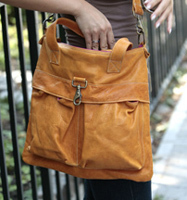 What I also love about her handbags is that are lots of interior pockets, and playful, feminine, colorful "pop" linings. Another attractive handbag from the Classic Collection is the Cranberry Tote, featuring a Chocolate Coggia soft Italian calfskin body with Camel suede detail, antique brass hardware, contrast stitching, is fully lined, and has 3 interior pockets. Living in New York, Elizabeth Phillips finds inspiration for her creations in many places; passing by a florist, she might see a flower or a leaf that catches her eye, or a small ornate carving on a wood chair or table leg will find its way into a design for her whimsical appliqués. Even the New York subway is a point of inspiration; seeing the rivets, a detail so minute that most commuters never notice them, found its way into the design for her studs on her handbags. She likes to take simple and plain ideas and then elaborate on them. Elizabeth also finds inspiration when she picks out the materials that she will use for her designs. As a designer she spends time doing her research on rising and waning fashion trends, and what she loves most about being a designer is seeing her idea develop from a thought, to a sketch, to the finished product. 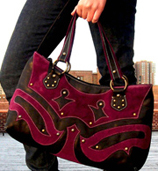 The Royalton Tote, from her Reverse Collection, is perfect for everyday use, or to use as a weekend travel bag. The bag features a nylon body and distressed shrunken lambskin trim, two exterior pockets, contrast stitching, antique brass hardware, three large interior pockets, is fully lined, and comes in Grey and Cognac; Navy and Tan; and Chocolate and Tan. The Jackson Fold Clutch is another little darling, featuring a distressed shrunken lambskin body with classic accent details, contrast stitching, is fully lined, and has two interior pockets. 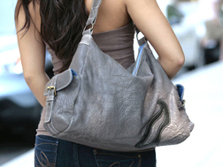 The hobo bag is a perennial favorite, and the Ballard Hobo, in Grey Vegas, part of the Reverse Collection, features distressed shrunken lambskin body with two exterior pockets, classic accent detail trim, antique brass hardware, contrast stitching, is fully lined, and has three large interior pockets. Nothing says New York better than the East Village Tote also from the Reverse Collection, which features a distressed shrunken lambskin body with two exterior pockets and classic accent detail trim, antique brass hardware, contrast stitching, is fully lined, has three interior pockets, and comes in a selection of colors including Sunshine, Black, Grey, and Tan. Although fashion trends may come and go, Elizabeth Phillips and Elspeth New York are clearly here to stay. Please visit the Elspeth New York website www.ElspethNYC.com to see Elizabeth Phillips' entire collection.